It is one thing to explore and another to uncover as this hiking couple who stumbled upon this local known path discovered. It contained stones that date the Earth’s existence. The stones come from different parts of Scotland for an unknown reason and it is largely through the local lore that more would be known about the builders, purpose or dates of this wonder. The large stone obelisk in the foreground of the photo they discovered, predates Christianity. Sometimes it is just taking the first step, and the journey begins. Scotland is full of rich lore and Druid traditions that speak to the natural elements of the Earth. Exploring a deeper natural sense of ourselves amongst the traditions of the old wisdom can bring the inquisitive mind that grasps for details and answers together with the how the soul discerns through what it feels. Explore place between mind and soul in your steps today, and allow yourself to discover something known in a new way. Stone Labyrinth of Getskär/Renskär in the Kalix Archipelago of Bothnia Bay between Sweden and Finland. Photo Credits: Seved Johansson. Labyrinths of the Scandinavian persuasion seem to be a natural part of the culture. Exploring this region one can find labyrinths are natural connections as they have been found in tribal communities and burial grounds indicating the familiarity and use over the ages. It is not uncommon to discover a labyrinth that’s been around for centuries, some dating back to 500 AD. In Sweden alone at least 300 labyrinths are known to exist, and In the Lapland, the arctic compilation of Sweden, Finland and Norway there are a few areas along the peninsula and in the archipelago of many islands that are known for a number of stone labyrinths, much like the ones found on Bolshoi Zaratsky Island in Russia. This labyrinth pictured above is part of a fishing village and as lore and legend are a part of the labyrinth, it is said that the labyrinths bring fisherman good luck. Exploring what is common place to natives often requires a little ingenuity to find unique features. Though with centuries of stories behind each labyrinth here, that alone may be the unique fascination. Explore the stories of the labyrinth you walk, discover its purpose and the practices it has provided. Discover your purpose and practices over time. One thing that can make something within us move is music. Whether it is the body swaying in synchronization or just a foot tapping along, every part of our brain is activated when music is present. There is quite a lot of wonderful scientific evidence regarding the elevation that it creates and as a result the field of neuromusicology has been developed to study the variety of ways our nervous system responds to music. 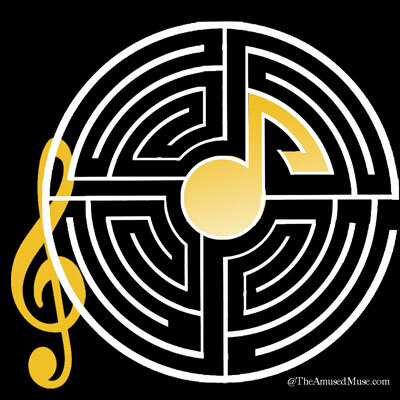 This of course is not new as ancient cultures revered music and for those who facilitate programs of the labyrinth, music is a natural accompaniment. In making the Roman Labyrinth round in design with a minor adjustment to the ancient design, what is found at the center, is a musical note. In many ways we walk the labyrinth to attune ourselves to a message, metaphor or meaning. At other times we walk to simply tune in to what is present around us or to a particular question. We are also fine tuning definitions, understandings and ideas and as we find the center, we can find our center and where we might be in tune or out in someway. Our year long message is to discover the chords that make our tune ring true. Enjoy your day with musical accompaniment and observe the simple appreciations and celebrations that occur. Walk with music today so that it is a different walk than you’ve experienced before. Use different music and observe what comes out in steps.